French crepe recipes might be served at any time of the day. You could enjoy them with fresh fruit for breakfast, with ham and cheese for a quick lunch or snack, baked into a creamy casserole for dinner, or topped with chocolate for a divine French dessert. Before you get started making crepes, be sure to have a gander at how to make crepes, which includes a dozen tips to insure success. Crepes needn't be a complicated affair. Indeed, in France, they are oftentimes served in casual circumstances - at an afternoon children's gouter or from a roadside stand crêperie. Here are some easy ideas for crepe filling that will have you out of the kitchen quickly and enjoying a delicious meal. I don't think most French people eat crepes early in the morning, but that's never stopped me. To enjoy crepes for breakfast, you might like to make the batter the night before, then in the morning you're ready to go. Or if you're an early riser, just mix up this breakfast crepe recipe and let it sit for an hour before you cook them. Served as a meal unto themselves, savory crepes are quite popular in France. If you ever travel to Bretagne, you will surely come across the Breton Galette , a large buckwheat crepe filled with everything from seafood to ratatouille. 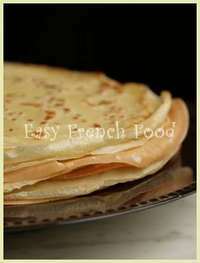 Here is a buckwheat crepes recipe along with some ideas for traditional fillings. More savory recipes: salmon crepes. One of France's most well known desserts, Crêpes Suzette , features sweet crepes flambed with orange liqueur. A spectacular affair. You needn't go to such lengths to enjoy dessert crepes though. Try filling them with fruit (strawberries, mandarin oranges, or pears would all be nice), then topping with whipped cream and chocolate sauce, for an easy finish to your next French inspired meal.